Quoi? Dr_sassy and the Derringers? That's never happened before. Sounds like a good band title, though. My first thought was, Did someone tag me by accident? As in, they want me to know about the Derringer Award, which honours the best short mystery fiction published in the English language? But another tag-ee, Britni Patterson, was already celebrating, so my heart kicked into high gear, just wondering if I was a chosen one. And if so, which story was it? I had two eligible tales. “Because,” a biting tale of 490 words published in Fiction River: Crime, and “Gone Fishing,” a 12,000-word serialized Hope Sze novella commissioned by Kobo and kindly mentioned by Sleuthsayers last year. I do love that story. Warning: it’s extremely noir. I don’t find it scary, but then I face blood, guts, vomit and potentially Ebola every day in the emergency room. I’ve already alerted the SleuthSayers powers that be that I’m not especially cozy. I’ve written what I consider cozies, and I love Precious Ramotswe and Agatha Raisin, but I also regularly stare into the darkness and take notes. When I attended the Writers of the Future winners’ workshop in 2000 and turned in a pitiless story about werewolves, the Grand Prize winner, Gary Murphy, stared at me and said, “I can’t believe that such a sweet-looking woman wrote this!" I laughed. I adore werewolves. And good stories of any stripe. But Cozy Monday may need a new name. Any suggestions? Cozy or Not; Cozy and Noir; Alternatively Cozy Mondays (because I’ll bet Jan Grape can stick to one genre better than literary sluts like Fran Rizer and Melodie Campbell and me); Cozy and Crazy…hmm. Back to the Derringer. Until now, I never really understood why awards have a short list. Well, I understood whittling down the list so that celebrity judges don’t need to plow through a mountain of stories. But now I get the glory of the finalist. I’ve won other prizes in a binary announcement. Either I win the award or I don’t. But right now, the uncertainty makes it all the more treacherous and exciting! 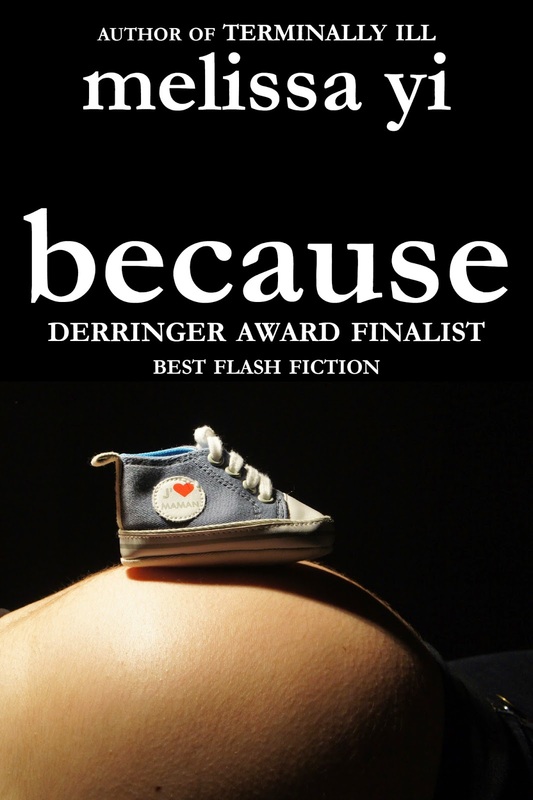 If you're curious, I’ve published “Because” for free on my website for the next week only. You can download it to your friendly neighbourhood Kindle, Kobo, iBooks device, Smashwords, or any format for a whopping 99 cents. That price will triple in a week. Please admire the cover photo by 28-year-old French photographer Olivier Potet. The non-cropped version is even better. 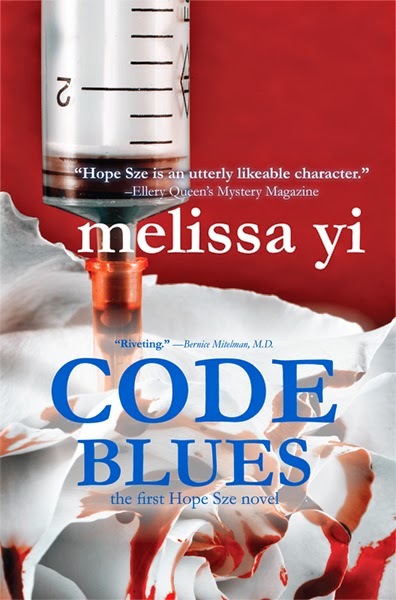 If Because tickled your fancy, you can also download Code Blues, the first Hope Sze novel, for free, as part of a bundle on Vuze, until March 16th. And please tune in on March 23rd, when I plan to write about how medicine trains your mind for detective work. Watson, anyone? Because I admire the line "I … stare into the darkness and take notes." I'm laughing. Best comment ever. Thank you! A terrific welcome to SleuthSayers. Congrats on the nomination, Melissa, and welcome to SleuthSayers! I look forward to reading, "Because" and will have my fingers crossed for you. 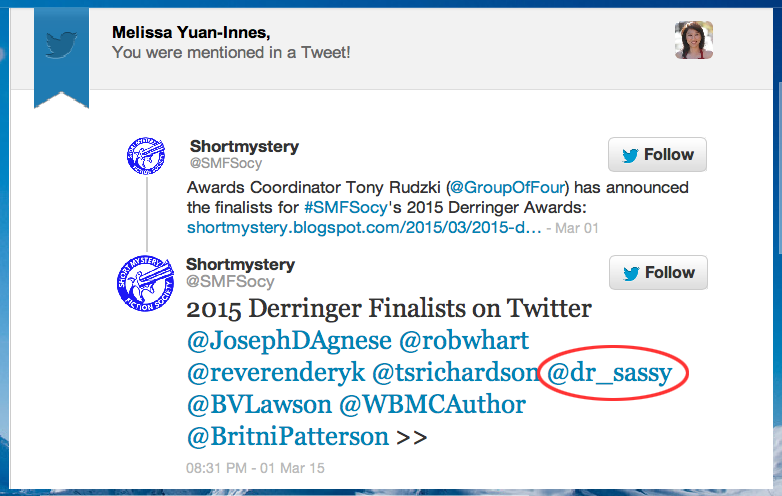 Congrats on the Derringer nomination, Melissa--I'm hoping you win! And I too would like to welcome you to SleuthSayers. Seriously good story, and congrats on the Derringer nomination! Glad to have you aboard on SleuthSayers. Great introduction, Melissa. Welcome to the asylum, and good luck with the Derringers. Rob. Asylum? But you said we were going to the zoo and the white jacket with extra long sleeves was to keep my hands warm in the cold weather. Ah. I love a warm welcome with optional straightjackets. Thanks, everybody. The zoo has a lovely view, excellent books, warm company, and a flask and a few flashers kicking around. I feel right at home. Welcome to SS and the WWW (wacky, weird and wonderful). Good wishes for your shot at a Derringer. You are in good company. Congratulations on the nomination, Melissa. You go, girl! Wonderful story, Melissa! And what a great addition to the Sleuthsayers. Hee hee. A shot at the Derringers. Love it @Broad Abroad. Thank you so much, @Anonymous. I really appreciate you reading my story and welcoming me. I know the feeling, @Britni. Interesting, because your Twitter bio is very confident! Does Your City Cut It?